This spider also known as the “linen spider” can leave a nasty bite which people all react differently too. These spiders are easily identified by their white-tipped tail and their greyish slender build. From experience we find they are commonly found in the Fairfield and Mosgiel suburbs due to temperatures than other Dunedin suburbs. Often this species comes indoors through open windows or are inadvertently collected with the aired laundry. Most bites occur at night following accidental contact with the white tail from linen or bedclothes, or the like. These are very distinctive and intimidating spiders due to their very large fangs that can deliver a similar feel to that of a bee sting. In Dunedin they prefer the sea-breeze and colonies can be found most commonly in Andersons Bay, and sometimes in Brighton or Pinehill. They are found in gardens, under rocks, in woodpiles and in bush areas. They feed on beetles and other small insects. 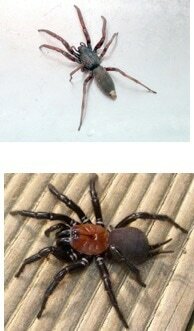 These photos show a nice example of the large brown vagrant prowling spider which was found by our technician in a property in Mornington, Dunedin. They are ground dwelling in gardens and forests throughout New Zealand. Their bite can be painful and can grow up to approx 27mm in diameter. This species has quite a distinctive set of marking on their abdomen. These spiders come in all shapes and sizes. Most people find this spider the most annoying due to the unsightly webbing issues on homes fences and buildings. They tend to get active around September/October as the weather warms on the northern faces of homes, buildings or structures. ​For professional service by a fully certified technician in the Dunedin and Mosgiel areas call us today!